You can see Kari peeking out from the bottom of the stack, but that seems to be the only thing carrying over from Runewars Miniatures, so far. I sure recognize a couple characters from Descent, which is where Baron Zachareth first appeared! It's definitely reasonable to look for clues for future releases in other Terrinoth games! I'm not usually will about card games, but this one intrigues me. I've heard great things about Warhammer Quest Card Game, and people seem to think this is its successor. Also this is cheaper than Runebound, Legacy of Dragonholt, and the Terrinoth source book, which is tempting. I'm definitely looking forward to more preview articles. I've heard great things about Warhammer Quest Card Game, and people seem to think this is its successor. From the photos this is absolutely the same game system, just in a new setting, more quests and characters and possibly a few changes to the overall game. 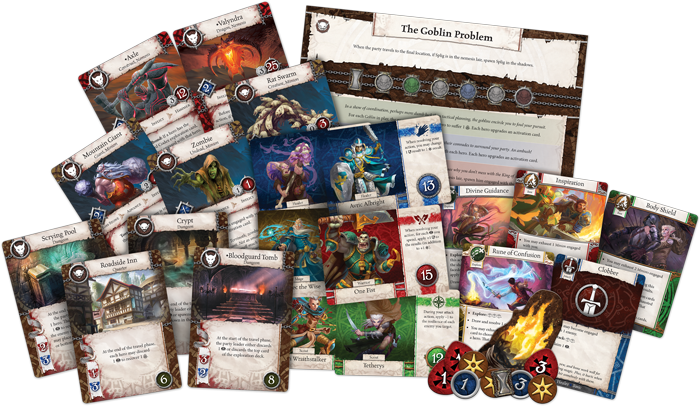 The Warhammer Quest Adventure Card Game was a very cool system that captured a dungeon-crawl experience in a card game (with some dice rolling too). Then the FFG/Games Workshop split happened soon after this game was released and the game died. The designers have also confirmed it. Some updates with classes and quest tweaks, but effectively the same game. Same game, but much better IP. I'm totally buying it! Is there going to be a "Heroes of Legion" six months after this is released? ... I'd rather they resurrect the old cooperative LCG design and revamp that if they're going for a co-op Star Wars card game.